On Tuesday night at Citizens Bank Park, Pete Mackanin placed the longest tenured Phillies player into the fourth spot of his batting order and hit the player with the second longest seniority fifth, one slot behind Ryan Howard. No, that player was not former All-Star Carlos Ruiz. He was traded three weeks ago. Freddy Galvis, a career .240 hitter known a lot more for his defensive prowess at shortstop than his ability with the bat, hit behind Howard on Tuesday night. It was the second straight game that Galvis was slotted ahead of All-Star Odubel Herrera in the Phillies lineup. If you guessed that would ever be a possibility two months ago, we’d like to take you with us to Las Vegas. But Galvis has been a surprising power source in the last month: he entered Tuesday’s game against the Pittsburgh Pirates with nine home runs in his last 30 games. To put that into perspective, Galvis hit seven home runs in 151 games in the 2015 season. Galvis, who is still only 26 years old, said he changed his diet last offseason. He met with a nutritionist as soon as the season ended and lost 10-12 pounds as he flushed out his system and then gained it back, but also distributed it better through healthier eating habits. Feeling healthier led to feeling stronger. But the bigger change probably occurred on Aug. 9 at Chavez Ravine. Before the second game of the Phillies series in Los Angeles last month, Galvis said he sat and talked with hitting coach Steve Henderson for at least a half hour about his “approach” and “everything (he) needed to do” to improve. At the time, through the Phillies' first 114 games, Galvis was hitting .227 with a .256 OBP and a .606 OPS. Even with his brilliant defense (which has been among the best in baseball this season), those offensive numbers are difficult to stick with if you’re a big league manager struggling to score runs every night. But after his lengthy chat with Henderson at Dodger Stadium, Galvis altered his swing. The adjustment hasn’t been drastic, but you can see from a home run he hit two months ago and from another homer he hit last week, he’s staying back slightly longer now than he did then. Freddy Galvis has altered his swing slightly in the last month, staying back on the ball a bit longer. It's resulted in nine home runs in his last 30 games. On the first home run, off Atlanta’s Arodys Vizcaino on July 6, Galvis has already begun his front leg kick before Vizcaino delivers (and, granted, Vizcaino throws very hard). On the second, on Sept. 5 against Miami’s Jake Esch, Galvis is still on his back leg with his front foot barely coming off the ground even though the ball has already exited Esch’s hand. 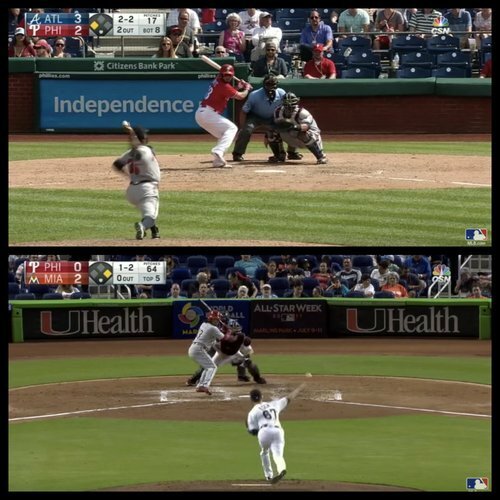 Maybe those aren’t the best photos to illustrate the change, but the alteration in his mechanics has produced results: Galvis is hitting .271 with a .322 OBP and .901 OPS, to go along with those nine home runs (and six doubles) in 116 plate appearances over that 30-game stretch beginning on August 9. Galvis believes staying back longer and swinging off his back leg has led to better contact more often: less foul balls, more balls hit well into fair territory. Overall, Galvis has 18 home runs, four behind Maikel Franco for the team lead. But, seriously. If Galvis is playing elite defense at shortstop, as he has, and has the ability to hit 15 to 20 home runs in a season, does that change how he’s evaluated? Sure, no one is going to put too much weight into small sample sizes. The current 30-game stretch doesn’t erase the 433 big league games that preceded it, and it doesn’t gloss over the fact that Galvis has a .286 OBP in 1,160 plate appearances since becoming the team’s regular shortstop at the start of last season. But, again, what if that comes with elite defense and decent power, too? (If the power becomes sustainable moving forward, of course). On defense alone, Galvis will have a place on the Phillies roster (barring a trade) in 2017. Top prospect J.P. Crawford did not have a strong finish at Triple-A and could benefit from more minor league seasoning next season. Until Crawford is deemed ready, Galvis will continue with his new approach and see if it continues to produce regular results. “I think I’ve been doing good work, a good job,” Galvis said when asked to evaluate his season, where the defense and power has been tempered with a .270 OBP, the lowest among all qualifying hitters in baseball. Galvis's nine home runs over his last 30 games are the six most in the National League since Aug. 9; only Charlie Blackmon ,(12), Jedd Gryorko (11), Kris Bryant (10), Freddie Freeman (10), and Randall Grichuk (10) have hit more. Over that same span, Galvis leads all major league shortstops in slugging percentage (.579), home runs (nine), extra-base hits (15), and ranks second in OPS (.902).